Dr. Strickland uses a special computer program that allows him to design and create dental restorations that feel great and look natural. This program is called CAD (computer-aided design) or CAM (computer-aiding manufacturing). The goal of CAD/CAM dentistry is to reduce the amount of time spent between designing your dental restoration and being able to start treatment. For example, Dr. Strickland is able to use CAD/CAM dentistry to create dental crowns more efficiently than ever before. This means you are able to put your dental visit behind you sooner than you thought. We are a family dental practice that prides itself on offering the best dental lab technology to its patients. 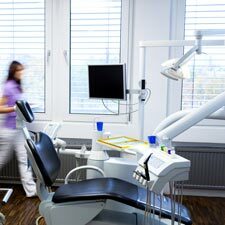 Another benefit of CAD/CAM dentistry is that certain dental restorations or appliances are made more affordable. To our patients on a budget or with insufficient dental insurance, this can be a lifesaver. If you are interested in learning more about our CAD/CAM dentistry services, please feel free to call our Rockford dental practice at (616) 866-1017. At Scott Strickland Family & Cosmetic Dentistry, we are dedicated to helping patients through family and cosmetic dentistry services.